Pastor Chemnitz has been called “The Second Martin”, in terms of his importance in the Evangelical (Lutheran) Church. He is the principal author of The Formula of Concord, the last of the Confessions in The Book of Concord: The Confessions of Lutheran Church. The Formula has two parts the Epitome and the Solid Declaration. The Epitome is like that word, it is the epitome,the summation, kind of a Reader’s Digest of the confession. The Solid Declaration is the unedited document. 8,188 theologians, ministers and teachers signed the Solid Declaration. On June 25, 1580, the complete Book of Concord was put on sale: exactly 50 years after the Presentation and reading of the Augsburg Confession to Emperor Charles V. The Book of Concord was complete and it is still the complete and correct exposition of the Word of God. A Lutheran pastor vows to teach, preach and administer in accordance with The Confessions as they are the true exposition of the Scriptures, the Word of God. A repeated phrase throughout the Formula is: “We believe, teach and confess…” This begins the affirmative theses. Then there are the negative theses in which the Confessors condemn false doctrine. Post-moderns do not like this. Post-moderns base their understanding of truth on what they experience and feel, our ‘free’ will…and such is a slippery slope, a Gadarene slide into the abyss ( Matthew 8: 28-31). Saving faith is based upon sound doctrine. “This doctrine is founded upon the Word of God…” (Solid Declaration , Article II, Free Will, paragraph 28, Tappert). “…it must [also] be carefully explained who are the unworthy guests of this Supper, namely, those who go to this Sacrament without true repentance and sorrow for their sins, and without true faith and the good intention of amending their lives, and by their unworthy oral eating of the body of Christ load themselves with damnation, that is, with temporal and eternal punishments, and become guilty of the body and blood of Christ. 69] For Christians who are of weak faith, diffident, troubled, and heartily terrified because of the greatness and number of their sins, and think that in this their great impurity they are not worthy of this precious treasure and the benefits of Christ, and who feel and lament their weakness of faith, and from their hearts desire that they may serve God with stronger, more joyful faith and pure obedience, they are the truly worthy guests for whom this highly venerable Sacrament [and sacred feast] has been especially instituted and appointed; 70] as Christ says, Matt. 11:28: Come unto Me, all ye that labor and are heavy laden, and I will give you rest. Also Matt. 9:12: They that be whole need not a physician, but they that be sick. Also [ 2 Cor. 12:9 ]: God’s strength is made perfect in weakness. Also [ Rom. 14:1 ]: Him that is weak in the faith receive ye [ Rom 14:3 ], for God hath received him. For whosoever believeth in the Son of God, be it with a strong or with a weak faith, has eternal life [ John 3:15f. ]. Lord, God heavenly Father, through the teaching of Martin Chemnitz, You prepare us for the coming of Your Son to lead home His Bride, the Church, that with all the company of the redeemed we may finally enter in to His eternal wedding feast; through the same Jesus Christ, our Lord, who lives and reigns with You and the Holy Spirit, one God, now and forever. Amen. The photo is of the pulpit above the Altar (!) in the city of Erlangen‘s Neustaedter-Kirche. The first time I saw a similar pulpit suspended above an Altar was in a mid 20th century Lutheran sanctuary in Berlin. I worshiped in a late 20th Century Lutheran sanctuary in the USA in which the pulpit, altar and font are all connected, As the pastor in Berlin commented: They wanted to emphasize the centrality of the Word of God! Yes, Amen! Orthodox priest and professor, Fr. Alexander Schmemann wrote the Word is sacramental as the sacraments are of the Word. I think that is a very orthodox Lutheran understanding of Word and Sacrament. Tomorrow is All Saints Sunday and the Gospel is the beginning of the Lord’s Sermon on the Mount, the Beatitudes. Where Christ is proclaimed for the blessing of the poor in spirit, and His Sacraments for those who hunger and thirst for righteousness. There is Mount Zion and the angels support the Word for us, for faith to take hold of again, for our salvation. Give thanks for all His saints in your lives tomorrow, in joyful remembrance of those who have died who shared the pilgrimage. A question I have put to Bible study groups is why are you a Christian or a Lutheran? The answers vary from upbringing to my friends to my family to a pastor. Very seldom has been the answer: my baptism. Baptism, Holy Communion, in fact all of the Bible, all of God’s Word gives us Jesus Christ. Why am I a Christian? Answer: Jesus Christ. Christian from the Christ, not Christ from the Christian. Why am I Lutheran? Answer: The Confessions of the Lutheran Church: The Book of Concord. The Confessions of the Lutheran Church are the only ones yes on earth that by God’s grace alone, got it right: God’s grace in Jesus Christ is His free gift that makes right sinners, not what we do, say or feel, however religious the actions, words or emotions, can save us. Christ came to die for sinners of whom I am the foremost. For what its worth, I have looked into other church bodies and much is commendable about them. I worked 4 years as a youth pastor in a Presbyterian congregation. I worked for three years as a receptionist at Jesuit Hall at St. Louis University and knew many find Jesuit priests and brothers, and monks and nuns. I have seriously looked into the Eastern Orthodox theology and practice. For instance, their purely Scriptural prayer for meditation, “Lord Jesus, Son of God, have mercy on me, a sinner” or the Jesus prayer Biblically beats out the rosary, the “hail Mary”, except of course in football…and that kind of prayer directed to saint, never gets to the Receiver, the one Mediator, Jesus Christ who alone makes us His saints. He invites His saints to pray to Him, our Father, not his saints to pray to others. Several years ago Natalie and I thought seriously of leaving the ELCA and becoming Orthodox. What stopped me? Answer: Synergy and hymnody and the two are related. Synergy, cooperation, having to work together with God for my salvation. Jesus kind of sort of saved us, sort of kind of by faith. So I got to meet halfway…then I am unforgiven and Jesus is no Rock of salvation, more like a pebble, but that’s not the case for me or for you or your family or your friends.The Lord came to us all the way: to the Cross. And it was colleague and mentor, Pr. Lou Smith who re-taught me the Lutheran Confessions with every retreat and practically every conversation and the beating heart of the Church, Christ’s body is the justification of the sinner by grace, as a gift, through Faith.. God’s law shows us the depth of sin and the Gospel the greater depths of His love for us all. And my wife could not leave hymnody as that Lutheran hymnody proclaims the eternal Gospel of God’s grace. I do not nullify the grace of God, for if righteousness were through the law, then Christ died for no purpose. Galatians 2:21 Beloved in the Lord, you His purpose. He pleased to give you His Son.We sing the praises of Him Who died and rose. We only know God’s good work in Jesus Christ. “We do not claim that our Confessors were infallible. We do not say they could not fail. We only claim that they did not fail.” (Charles Porterfield Krauth, Lutheran theologian 1823-1883) They got it right because they knew by Whom they were made right, justified, not by the Law, but by God’s own Son fulfilling every jot and title of the Law, forgiving us upon the Cross. We know this by the Bible. Yes, Lutherans believe in Scripture but so do other Christians. In this we rejoice. However, the Reformation was not about reforming a few bad morals and a proper cleanup of the papacy, or a new kind of church government and a polishing up of a few doctrines according to the Bible. All of that had been done prior to Luther and for quite a time and after 1517. They all look at the Bible as laws to be followed for a reformation. In fact, in many ways, the Lutheran Confessors did not want to reform the Church, it was the Lord by His Word and Sacraments reforms the Church, us, you, making us His own in Holy Baptism. Everyone wants to see something great, but the Word of God is best thing anyone can hear. Mahatma Gandhi, a Hindu, read the New Testament and thought Jesus’ word,” turn the other cheek” as a way to reform society…and he went along way with it and India was better for him. All sorts of people have seen the Bible as source of good advice, and there has been no end of advice, but good advice does not forgive, good advice will not bring us into the Kingdom. The Bible is something else than a rule book of reforming zeal. What Jesus Christ said is apropos here: “You search the Scriptures because you think that in them you have eternal life; and it is they that bear witness about Me.”John 5:39 The Key to understanding the Bible is not reforming according to the law but being reformed, renewed by the forgiveness and reconciliation of sinners by Jesus Christ. Jesus said the Scriptures bear witness to Him. The Key is Jesus Christ who unlocks the door to paradise is His crucifixion and resurrection, justification by grace through faith, freely given, no if, ands or buts, who alone frees. Yes, Jesus but if you make your decision for him. Jesus and your good works will get you in. Jesus but you have to be good. If it is “if, ands and buts”, more Law, then Christ died for nothing. By faith through grace He made us good, makes us good as His son,as His daughter. We have Bibles in which Jesus’ words are printed in red. A great and humble Lutheran pastor and professor, Johann Gerhard (1582-1537) said the Bible is read as if it were printed with ink that is the very blood of Jesus. The key to the Bible is not only Scripture alone but from the Lord’s Word and the Word made flesh grace alone received by faith alone. All add another condition to grace and then it’s not grace, which is free and frees, You will know the truth and the truth will set you free. John 8:32 It has. I am a Lutheran because of the Confessions as true exposition of the Word of God. Now don’t get me wrong, we don’t have to join the Lutheran Church-Missouri Synod in order to be saved, that would be adding a condition! I think,…I know that the LCMS is one of the few church bodies in North America which adheres to the public doctrine of the Scripture and the Confessions faithfully. But it is not the alone saving church. All who know by grace they are saved are my brother and sister. There is only one Church, Christ’s bride and He is no bigamist. “For, thank God, [to-day] a child seven years old knows what the Church is, namely, the holy believers and lambs who hear the voice of their Shepherd. For the children pray thus: I believe in one holy[catholic or] Christian Church.” As Luther wrote in the Lutheran Confessions, the Smalcald Article. In a favorite episode of sitcom “Everyone Loves Raymond”, the entire family goes to church except for Ray who doesn’t go at all. Ray’s wife, Debra asks Ray why don’t you go to Mass? After being embarrassed Ray tells some story about a repairman who comes over to fix something, and he had a lazy eye, and how Ray was so good not to be seen to notice it…Ray concludes, I’m good…that’s why I really don’t need to go. So, says his wife, on a Sunday morning, Ray, we should just all come over and gather around you? A pastor in the LCMS, Daniel Preus wrote a little book, Why I am Lutheran: Jesus in the center. Not Ray, not you, not me. “For the Church does not live by morals, by the knowledge and observance of God’s law. Nor does it live by religion, by lofty experiences of the divine and an awareness of the mysteries of God. It lives solely by the forgiveness of sins.” (Hermann Sasse, Lutheran Professor, Pastor and theologian, 1895-1976). We don’t gather around ourselves and our fine Christian principles, then that’s club. The Holy Spirit calls, gathers, enlightens and sanctifies the whole Christian church on earth and keeps her united in Jesus Christ, Luther taught on the 3rd article. The Church is Christ’ body. The angel had the eternal Gospel, good news to proclaim…not temporal time conditioned good news, like TV commercials. Commercials which tell you your outsides aren’t too good and if you just had fill-in-the-blank, there product is good news. Or the time-conditioned temporal gospels of denominations and their programs. We can do an extreme makeover but our souls remained untouched and the Lord is clear, it’s there, in your, heart soul and mind I have come to be your Lord with every Word from My Book, My Sacraments, My people, My pastors to make alive your Faith holding on to Me as I hold on to you. We are gathered in the Name of the Father, and of the +Son, and of the Holy Spirit. Amen. 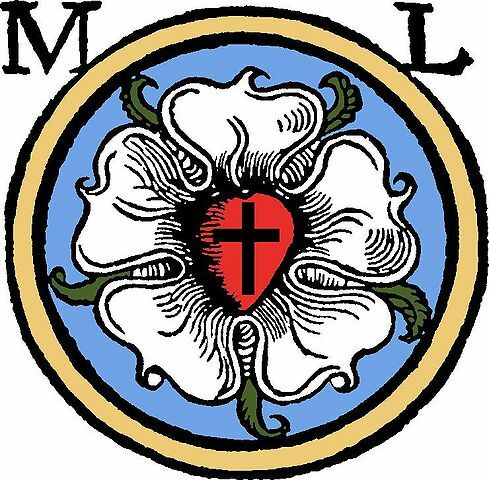 From the Wikipedia article: The Luther seal or Luther rose is a widely-recognized symbol for Lutheranism. It was theseal that was designed for Martin Luther at the behest of Prince John Frederick, in 1530, while Luther was staying at the Coburg Fortress during the Diet of Augsburg. Lazarus Spengler, to whom Luther wrote his interpretation below, sent Luther a drawing of this seal. Luther saw it as a compendium or expression of his theology and faith, which he used to authorize his correspondence. Luther informed Philipp Melanchthon on September 15, 1530 that the Prince had personally visited him in the Coburg fortress and presented him with asignet ring, presumably displaying the seal. “Grace and peace from the Lord. As you desire to know whether my painted seal, which you sent to me, has hit the mark, I shall answer most amiably and tell you my original thoughts and reason about why my seal is a symbol of my theology. The first should be a black cross in a heart, which retains its natural color, so that I myself would be reminded that faith in the Crucified saves us. ‘For one who believes from the heart will be justified’ (Rom. 10:10). Although it is indeed a black cross, which mortifies and which should also cause pain, it leaves the heart in its natural color. It does not corrupt nature, that is, it does not kill but keeps alive. ‘The just shall live by faith’ (Rom. 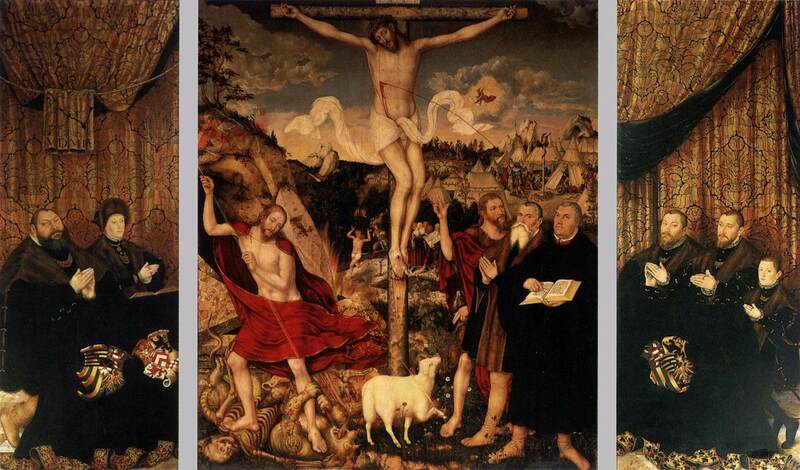 1:17) but by faith in the crucified. Such a heart should stand in the middle of a white rose, to show that faith gives joy, comfort, and peace. In other words, it places the believer into a white, joyous rose, for this faith does not give peace and joy like the world gives (John 14:27). That is why the rose should be white and not red, for white is the color of the spirits and the angels (cf. Matthew 28:3; John 20:12). Such a rose should stand in a sky-blue field, symbolizing that such joy in spirit and faith is a beginning of the heavenly future joy, which begins already, but is grasped in hope, not yet revealed. And around this field is a golden ring, symbolizing that such blessedness in Heaven lasts forever and has no end. Such blessedness is exquisite, beyond all joy and goods, just as gold is the most valuable, most precious and best metal. This is my compendium theoligae[summary of theology]. I have wanted to show it to you in good friendship, hoping for your appreciation. May Christ, our beloved Lord, be with your spirit until the life hereafter. Amen. Our friends at Lutheran Hour Ministries have produced “The Intersection of Church & State,” a one-hour documentary that will air at 5 p.m. ET Sunday as paid programming on the Fox Business Network.The documentary looks at the multi-faceted topic of church and state from a theological perspective, emphasizing how the church and state can work together for the betterment of society. “The Intersection of Church & State” traces the history of cooperation between these two groups — in bringing care to the needy, the settlement of refugees, the adoption of children, the service of military chaplains, and other ways. It also considers how these historic church and state partnerships are jeopardized.The program features the comments of respected church leaders, including LCMS President Rev. Dr. Matthew C. Harrison. It has been reviewed and approved for doctrinal integrity by the LCMS.Please check your local listings or visit www.intersectionofchurchandstate.com for show times. If you are unable to watch the program, you can download it online beginning Sunday. You also can purchase a DVD with a discussion guide that can be used for Bible studies, men’s or women’s groups, or as a tool for individual study and research. PS: You also may be interested in accessing the LCMS’ educational resources about religious liberty. You can find articles, a timeline of the fight for religious liberty, frequently asked questions, videos, a Bible study and a sample letter you can personalize and mail to your representatives. To learn more about the LCMS effort to protect religious liberty, visit www.lcms.org/freetobefaithful. This reflection on evangelization is for everyone! Check out the Lutheran Hispanic Missionary Institute. Are lost people really lost? In the movie The Sixth Sense, Dr. Malcolm Crowe, a child psychologist played by Bruce Willis, works with an eight-year-old patient called Cole Sear, played by Haley Joel Osment. While it is not my purpose here to ruin the movie for you if you’ve not seen it, the character Cole Sear has the ability to see dead people walking around just like regular people. The line he uses with Dr. Crowe to inform him of this ability has become something of a classic, “I see dead people”. While I was attending seminary, I had a missiology professor who gave an interesting writing assignment. It was simply this, “Are lost people really lost”. While I had to do a lot of research for the paper, and read a lot of Scripture, I affirmed the position I started with, yes, they are. If a person has not received grace, through Christ, then they are lost. Or another way of saying it might be that they’re walking around dead. I recently asked the same question to a group of Christians and got mostly the same answer. However, there were a few that just could not accept the concept of hell and there were a number who believe there were many ways to get to heaven. Virtually all of them were willing to extend undeserved credit to the “good” people, while extending no mercy at all to “bad” people. In other words, they saw very few, if any, dead people. If there is any consistent trend that I have noticed over the 30+ years of my ministry, it is that the longer people are Christians, and the longer churches exist, the less likely it is that they will have strong connections with the unchurched community around them. They simply stop seeing dead people. Before you quickly disagree with me, take a moment and list all of the people you know. Now, indicate which ones you know to be Christians and which ones you know who are not. How many are on the second list? Any at all? This summer I have attended five district conventions for the LCMS. During one of the conventions I heard a report that the district had experienced one adult baptism for every 30 churches in the district. Of course, this does not include the children, but can it be said that these churches are seeing the dead people in their community? New Christians win people to Christ faster than older Christians. New churches win people to Christ faster than older churches. These two truths underscore the need for adult baptisms and new church planting. And they should also send the message to older Christians and older churches that they need a strong renewal of their vision. Each Christian needs to be able to say, “I see dead people”, and of course, to want to bring them once again to the land of the living. If we truly have the heart of Christ, then we should weep when he wept.